The Art of the Rapturist – Love. Life. Practice. But one of her stories in particular stood out to me. It was when I asked her about the “weirdest” place that she ever hula-hooped. The answer was: a gas station. That might not seem weird to you, but the circumstances were, shall we say, sub-optimal. It was one of those hot, muggy days when everyone wants to go out and play in the sun – but first that requires a full gas tank, and for whatever reason, the local gas station was pumping really slowly. One of the things we discussed, though, was the motivation. It wasn’t that she set out to entertain people – that idea that people might laugh was her worst case scenario. In other words, it was part of the evaluation of What Might Go Wrong. The actual motivation for taking out the hoop? “Well, what else are you going to do?” was the way she put it. Personally, I think of this as kind of a side corollary of one of my favorite mantras: Start where you are. Use what you have. Do what you can. In this case, the corollary would be something along the lines of If you can’t do something productive, do something fun. There was nothing that Traeonna could do to make the pump go faster, or the day cooler, or the people less grumpy…so she did something fun, instead. The result was turning a grumpy crowd into a grinning, laughing, and talking group of people. What if that hadn’t worked? Well, she still brightened her own day, in a way that took nothing away from anyone else’s. 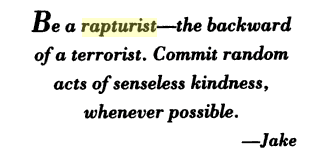 The author Spider Robinson speculated that this idea of random acts of joy would be the opposite of terrorism – he liked the word “rapture” and encouraged people to be “rapturists”. This is different than “paying it forward” or any kind of karmic balancing – that’s a quid pro quo. A rapturist does the act for the sake of doing it. I think of Banksy as a good example of a rapturist, along with many other street artists and musicians. YouTube and Pinterest and other social sharing sites (especially the ones with fuzzy animals) are great playgrounds for beginning rapturists. What do you think? Has a rapturist ever made your day better? 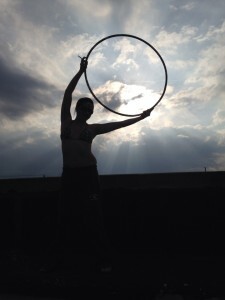 Are there ways you can rapturize your own environment?